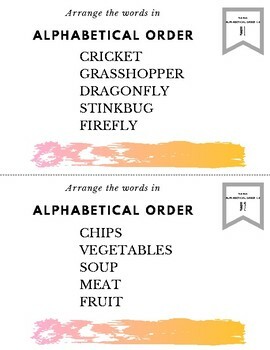 Your students will get plenty of alphabetical order practice with these 20 task cards. Each card features a set of five related words with different beginning letters. Students will need to use their alphabet sense to either write the words in order (getting additional handwriting practice!) 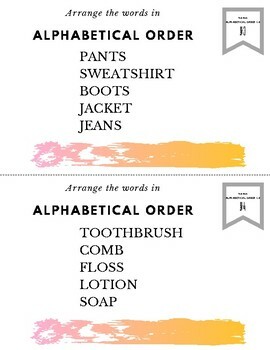 or number them in ABC order. Use as whole class activities, in small groups, or individually at a literacy center. The option is to use one card at a time with the entire class makes a great whiteboard activity. Students can answer in their literacy notebooks. 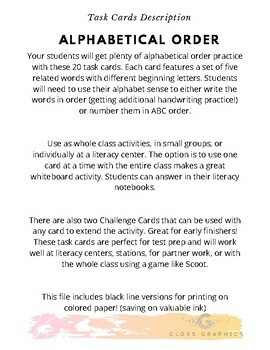 There are also two Challenge Cards that can be used with any card to extend the activity. Great for early finishers. These task cards are perfect for test prep and will work well at literacy centers, stations, for partner work, or with the whole class using a game like Scoot. 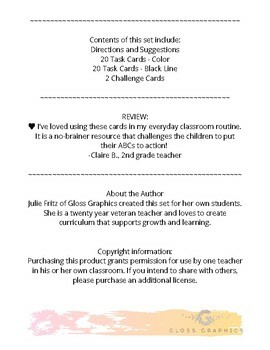 ♥ I’ve loved using these cards in my everyday classroom routine. It is a no-brainer resource that challenges the children to put their ABCs to action! Julie Fritz of Gloss Graphics created this set for her own students. She is a twenty year veteran teacher and loves to create curriculum that supports growth and learning.